Helen Kirk is an Artist friend from the PIL website and I was very honoured that she chose to write her diploma work on one of my paintings. 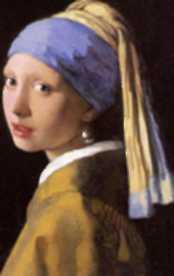 Please find below a copy of Helen’s review, comparing Johanne Vermeer’s – Girl with Pearl Earring with Alexandra G’s – The Earring. The Earring is a mixed-media painting in a contemporary style by English artist Alexandra G. It is a portrait of a woman, one would guess in her late twenties. The focal point of the painting is the blue, drop shaped earring she is wearing. It is very interesting to compare the contemporary portrait with that of Vermeer’s Girl with a pearl Earring, painted nearly 350 years ago. Not only is the style of work completely different, but the essential character of both models shows through in the work and provides and interesting insight into how the world has changed. Vermeer’s model has an air of total innocence, untouched by life. She looks hesitatingly over her shoulder, meeting your eyes reluctantly, as if she is waiting to be told what you want of her. Alexandra G’s model looks as though she has seen it all – her face is hard, her eyes look directly at the viewer, challenging you to accept her the way she is or walk away. Vermeer’s use of chiaroscuro brings the girl into sharp focus; the picture gives the effect of the girl having stepped out of time – she is there, she has nowhere else she needs to go and nothing else she needs to do. Alexandra G’s woman melts into the background -you cannot tell where her hair and clothes stop and the background begin. To me this gives the impression of a busy life, she is constantly on the go and it has been difficult for her to stop long enough to be caught in the picture. thought out; however I think the final result speaks for itself. It is difficult to judge the significance of an artwork by a living, practising artist, because words like significance only tend to get used about an artist’s works after they are dead and gone! picture uploaded on the 13lh July 2009, and also the second highest rated picture overall on the site for July 2009.